Technically we didn't take the summer off, so this isn't the true first day, but it is the first day of this school year. 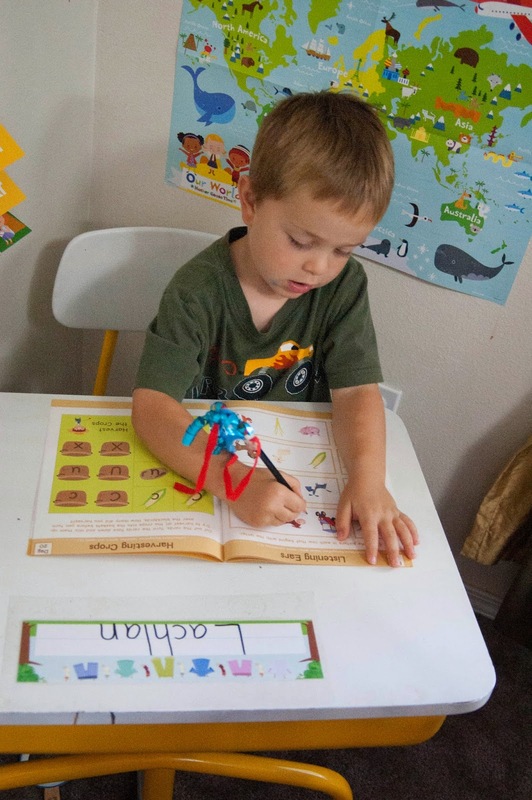 Lachlan is now officially in Kindergarten and Peter is now officially in Preschool. 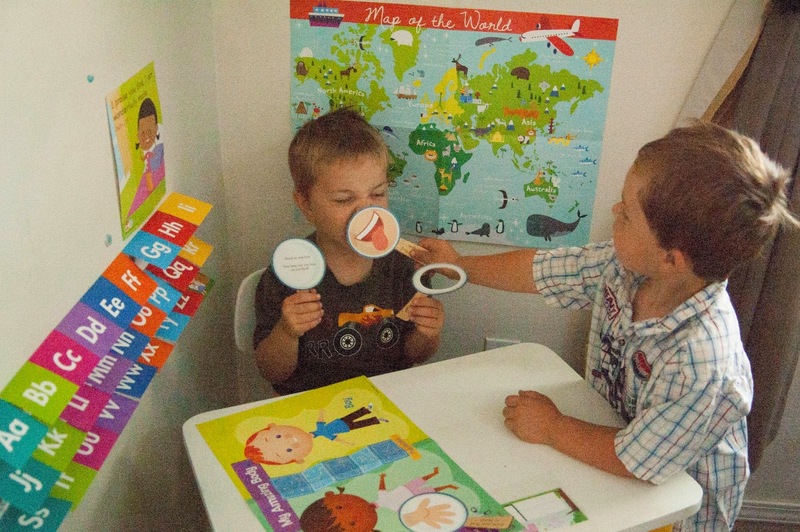 We are going to continue to use Mother Goose Time for both boys. 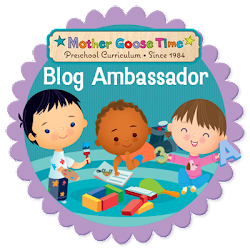 Although Mother Goose Time is technically a preschool curriculum, it can easily carry you through to first grade with all they they include. My plan is to just try to push him in areas of reading, writing and math. Take what MGT has provided and add on to it as need to challenge him. The cool part is, that their developmental continuum of skills shows what skills they need all the way to primary school. So if I can get Lachlan to benchmark H in all 33 of the skills, he should be ready for 1st grade no problem. 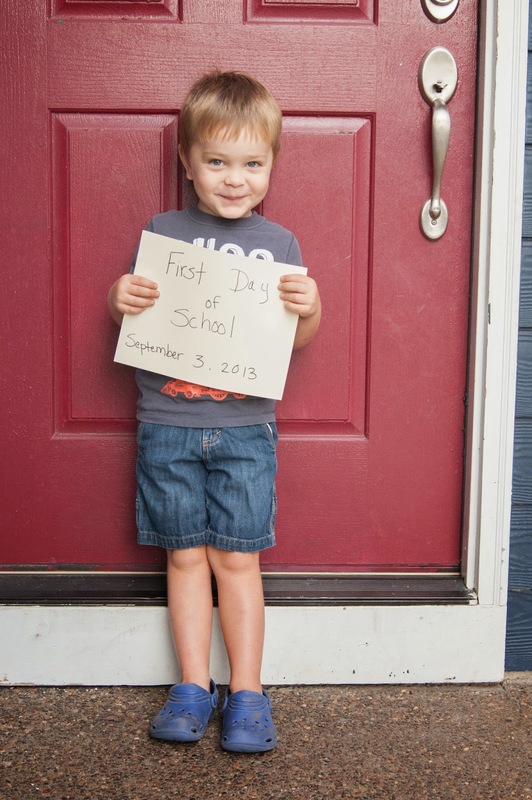 We ended our day with pictures by the front door, as we did last year on their first day. 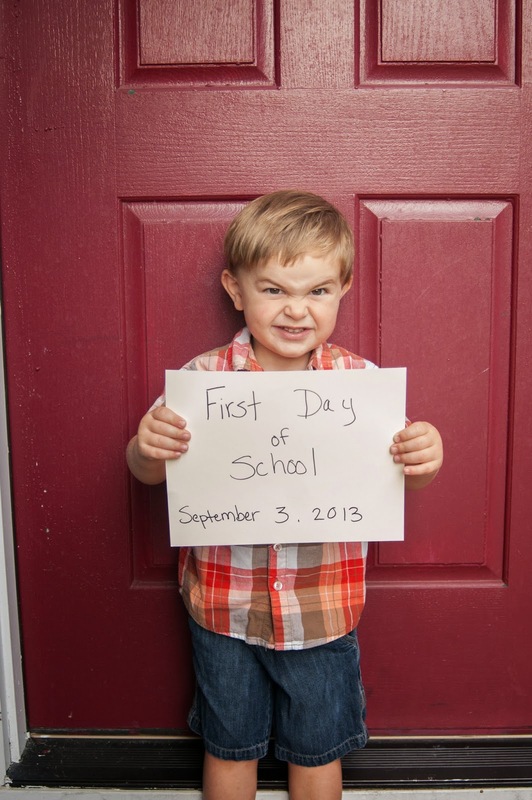 Every year on the first day of school Facebook explodes with pictures of kids holding signs with their new grade on them. I figure we can do the same thing even though we school at home. Just for fun, here's last years photos. With Lachlan being in Kindergarten now, I really wanted to get a good routine going. I need to stick to it and see how he does. I have a feeling he could really benefit from more structure. I will post in detail about our new schedule in my next post. But for now, here is a bit from our first day, which was all about Me. We started our day with Circle Time at the dining room table while we ate breakfast. I asked Lachlan, what do you like about yourself? "My tongue, because it helps me get the food in my mouth and it helps me chew it up." Peter says "my feet, they help me walk." And Lachlan added "Adam likes his arms, to grab stuff." I thought it was awfully nice for Lachlan to include Adam and answer for him. 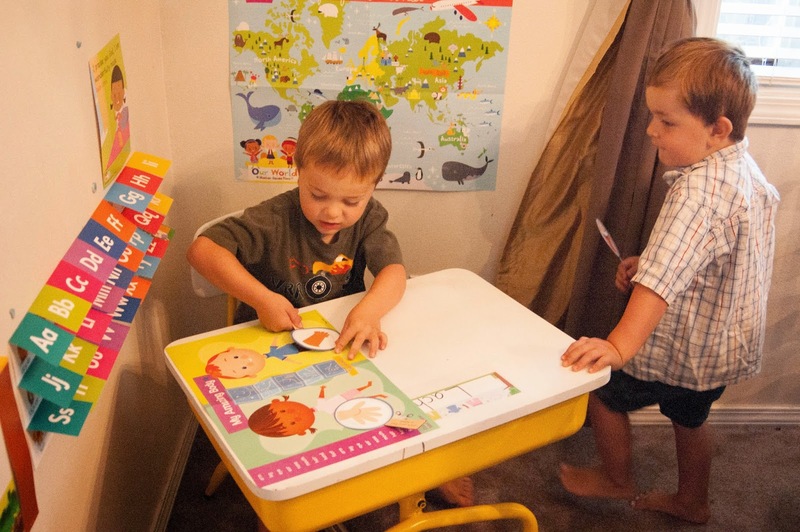 The calendar and weather are right by the table so I assigned one task to each boy and had them hop down quickly from the table to put up the calendar piece and weather. They are not really happy with sharing this task, so I need to come up with a new plan. Next we sang the opening song to the tune of "Frere Jacgues". I am Lachlan, I am Lachlan, I like me; I like me, I have pretty blue eyes, And brown hair on my head, I am Lachlan, I am Lachlan. We also got down the brown bird from the display wall and talked about his color. He was a baby bird we had to be gentle with and fly him to something brown. This was easy, since we were sitting at a dark brown wood table. I followed the order of lessons recommended in the new Planning Journal provided my Mother Goose Time. We started the day with Listen and Try. So once we were done with breakfast and officially ready for school we gathered around Lachlan's new Kindergarten desk (more about that later too) and spent some time with the theme poster. Peter found a mouth and tongue, just not on the poster. Here, Lachlan found a foot. Next we made puppets with paper bags which I somehow didn't get any pictures of. After the first two lessons we took a break. It ended up being a couple hour break. Autumn came over for a bit and played. We started back up again at lunch. I had them sitting down and eating, so we started on the next subject. Counting Letters had me ask them how many pieces of clothing they were wearing. At first Lachlan said 2, but I reminded him that he was wearing underwear and socks. So he did a re-count. Next MGT had them count the letters in their name. For Shades of Brown I got out our big tin of crayons and we sorted through and found all the brown crayons and set them on the tray. We did this while we were still eating. Once they were all on the tray we put them in order from dark to light. The boys thought this was pretty cool and so did I. We were all done with lessons and were busy playing when the doorbell rang. It was the UPS truck bringing us our new wall mounted pencil sharpener. We had one small cheap pencil sharpener that I kept losing. So I thought this would be a good purchase. I figured the boys could do it themselves. They really wanted to try it out so I sat down and held on to it while they turned the crank. The pencils came out really sharp, yet still, they wanted to do it again. I said no, the sharpener can only be used on pencils that are dull because they were used writing. They both quickly ran to their school spots and wanted something to write. So I got out some old More Math & More Reading books. This gave them great motivation to get some workbook time in. A little later in the day we also did an Experience God lesson. I went ahead and ordered the curriculum that goes along with this months MGT theme. We did the first lesson about healing wounds. Jesus and his miracles are the topic of Experience God this month. I read the first story card and then talked about what it would be like to be sick for a long time. Then we gave them toilet paper to use to wrap each other up. My boys chose to wrap their injured toys up. 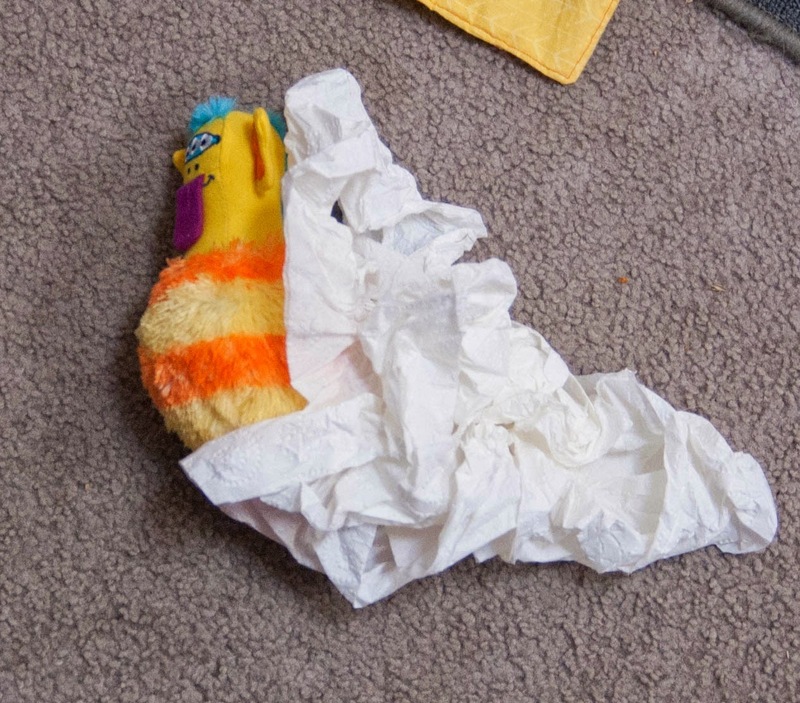 So although this just looks like a random pile of toilet paper laying next to a toy, it is in fact an injured animal being treated by Dr. Peter. I love the explain section of each Experience God lesson: God knows just what we need when we are hurt.